A Zip to the Marshland: The significance of Tris’s high flying adventure. 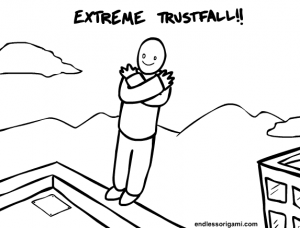 When I compared the slide down the Chicago zip line to the swing of the Dauntless faction from stability to instability, it was an afterthought to my previous posts on personality theory. But I have recently had occasion to look through that scene in more depth and I have concluded that the significance of that outing is far greater than I realized. Usual spoiler warnings apply. But if you haven’t read these books already, you really should! It’s training time in Divergent. Tris is at a low point, reeling from the trauma of first witnessing (Ew!) then mopping up the blood (Ew! Ew!) after the butter knife attack on Edward when she is surprised and honored to be invited on an excursion by some native-born Dauntless kids. Granted, not everyone is happy she joined their party– a very rude skinhead stomps on her foot– but she manages to enjoy herself, taking a break from the drama of the transfer class and relaxing a bit before the second phase of training. Right? Wrong. The bonding and trust-building Tris did with the other Dauntless (Shauna, Uriah, Zeke, etc) who will eventually become her comrades in arms is crucial, to be sure, but it is not the only important effect of that scene. The zip line outing performs several important functions. It certainly represents Dauntless’s recent slide from the selfless bravery of Tobias to the brutal ruthlessness of Eric. I was half-joking about the significance of the Hancock tower, but now I’m going to take that clue seriously. First, the starting point. Tris knows it only as the Hancock building, “a black pillar with crisscrossed girders, the tallest building north of the bridge” but Chicago tourists will recognize it as the John Hancock Center, once the tallest building in the world outside of New York and still among the top ten. Unlike Tris, we know that the building bears not just the signature Dauntless color, but the name of a famous patriot (some would say, insurgent) of the Revolutionary War, a man who took considerable personal risk for the sake of other people. 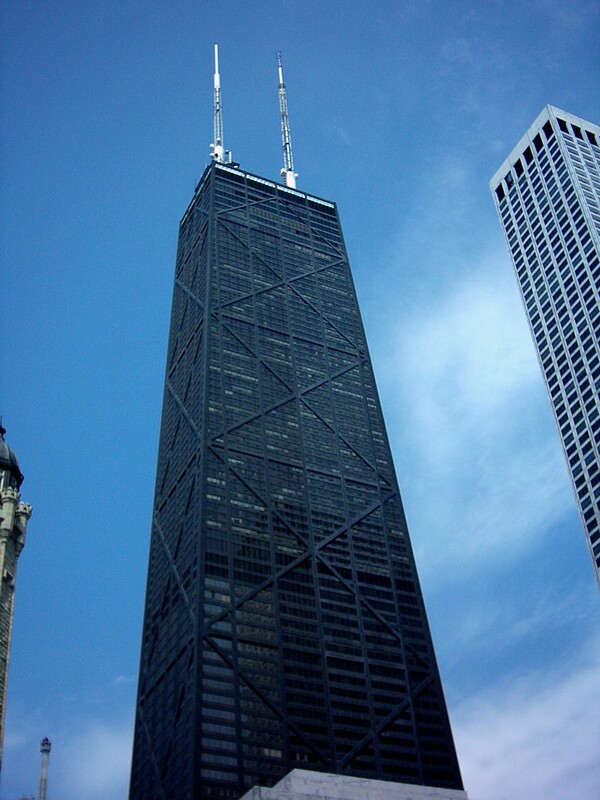 John Hancock is often held up as a textbook example of one who had, in accordance with the Dauntless Manifesto, “the courage that drives one person to stand up for another.” Given the driving force Tris will later become in the fight against the tyrannical Erudite, it should not surprise us that, once they get to the Tower elevator, Tris instantly knows where they are supposed to go. Next, the endpoint. The ride ends on a “cracked and patchy street” that follows alongside the muddy marsh that was once Lake Michigan. 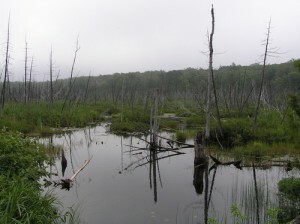 We have seen this marsh before. Though the citizens know it was once a lake, it is now “wide and brown and everywhere, touching the horizon, devoid of life.” Tris, as a child in Abnegation, had frequently tried to visualize the marsh as a lake, but found it “difficult to imagine that much water in one place.” Throughout the series, it is a depressing reminder to the people of how badly Chicago has decayed. Dauntless itself, like the zip liners, has plummeted from a strong pillar of courage to a dark and miserable remnant of its former self. Finally, the dismount. When Tris comes to a stop, she finds herself dangling 20 feet up in the air. In “a braver act than sliding down the zip line” she has to unhook her harness and trust the native Dauntless not to let her go splat on the pavement. Even that nasty skinnhead girl. They successfully catch her; and we all sigh with relief. I admit I didn’t pay much attention to this the first time I read it, except that the Erudite in me wondered how Shauna, the first to zip, managed to get herself down. And did she catch the next rider singlehandedly? 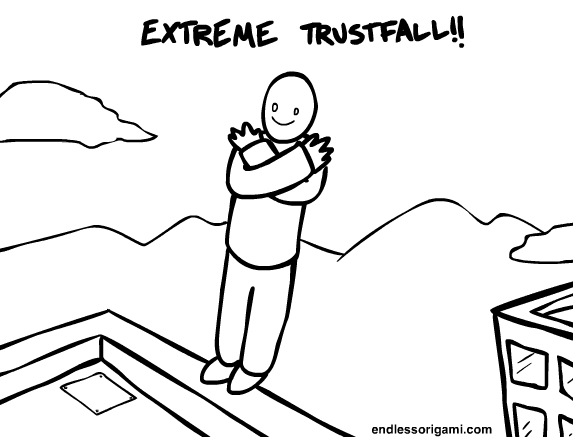 But let’s look the important matter: Tris’s trust fall. A crowd of members stands below. They grasp one another’s arms, forming a net of limbs below me…I hit their arms hard. 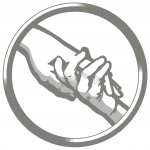 Wrist bones and forearms press into my back, then palms wrap around my arms and pull me to my feet. I don’t know which hands hold me and which hands don’t; I see grins and laughter. Hmm… a lot of emphasis on hands and arms. Tris, ever the team player, joins as a catcher for the next daredevil. We line up beneath him and thrust our arms into the space between us. Shauna clamps a hand around my elbow. I grab another arm—I’m not sure who it belongs to, there are too many tangled hands—and look up at her. “Pretty sure we can’t call you Stiff anymore.” Shauna says. Two things of note: 1) more hands and arms and 2) the Dauntless really seem to accept her as one of them, since they give up the old disparaging nickname. But where have we seen outstretched hands before? I know why my father said the Dauntless were a pack of madmen. He didn’t—he couldn’t—understand the kind of camaraderie that forms only after you have all risked your lives together. But this scene is more than just a pointer to a brighter future for Tris. It’s a shot of much needed optimism for the entire faction, particularly after the brutal sparring matches and the midnight sneak attack on Edward. Remember Tobias’s credo that bavery and selflessness are not far apart? Away from headquarters and Eric’s brutal training regimen, these young members show that, even though they have fallen away from the heights of bravery represented by the John Hancock Center, they are still capable of adopting the symbol of Abnegation selflessness, outstretched hands, and linking them to form a united team in the face of danger. Perhaps there is hope for Tobias’s vision, after all. But what is perhaps most important for Tris is not the beginning or the end of the thrill ride, but what she sees, in her mind’s eye, on the way down. For the first time, she “can imagine, up here, how the marsh looked when it was full of water, like liquid steel as it reflected the color of the sky.” It is not just Dauntless who have the potential to work their way back to their kinder (if not gentler) past, it is the whole city. When Tris has a chance to reflect on her adventure back at headquarters, she thoughfully recaps the beginning and endpoints for us, in case we forgot or did not think them significant. But it is not the newfound friendships and acceptance she ponders, but the imagined lake. All I can think about is staring down the side of the Hancock building, and the image I got of the marsh full of water, restored to its former glory. By the end of Insurgent, of course, Tris has learned that it is not just dystopian Chicago’s moral compass she needs to reset; she is Divergent, born and bred to save whole rest of the world from its evil self. Let us hope the thrill of the zip line sustains her as she undertakes that minor chore that awaits outside the fence, in the next book. It can’t be that much more difficult than overthrowing the Capitol or hunting Horcruxes, could it?